For a LONG time, this cat, whose name is Cali Mom, was available for adoption at my local Petsmart. You've probably seen her on here before, maybe once or twice. She had kittens, but they were quickly adopted. She was adopted about a month and a half ago. I was glad, for she deserved a home, even though she hissed and scratched at anyone who came her way. Yes, she was very skittish and mean, but she still deserved a home. Plus, she is a beauty! 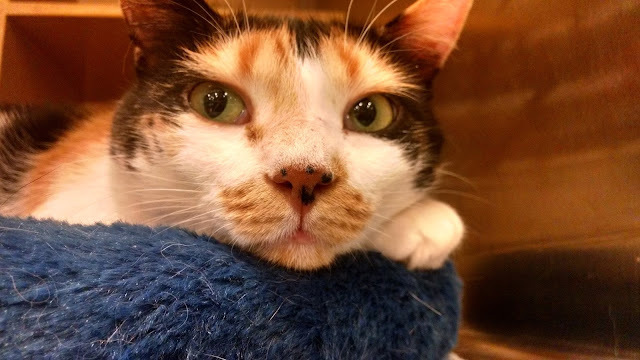 Who could resist Cali's lovable calico face? Don't get too close though!